The graphical user interface now in use by every major operating system in the world has an intriguing history. First thought up in 1945 by Vanaver Bush in his "memex" computer, he envisioned a time when users would interact with a machine with a graphical interface. He later wrote a little about its design, but never really did anything with it. In the 50s though Douglas C. Engelbart took this idea and began to work on making it a reality. Working at a section of the Department of Defense called the Advanced Research Project Agency (ARPA) he recruited several gifted computer scientists to design such a revolutionary machine. His team has many interesting ideas, and developed a couple notable products. The most notable of which was developed in 1963; a pointing device that had three buttons on one end and a cord one the other. Because the three buttons looked like eyes and a nose and the cord looked like a tail, the little pointing device was christened the "mouse". Unfortunately, Engelbart enventually lost funding before he could finish his project. Most of the engineers working for Engelbart fled to a new facility at 3333 Coyote Hill Road, in Palo Alto, California. Called the Palo Alto Research Center (PARC) it was established in 1970 by Xerox Corporation. Not wanting to lose out on this new computer revolution Xerox had set the place up for useby the greatest geniuses in the computer industry at the time. They paid them simply to perform research pertaining to the field of computer science to eventually create new advancements in computers, regardless of price. Taking the visions of Engelbart, and their new visionaries like Larry Tesler and Alan Kay, these began work on a new type of computer. They decided that its operating system would do away with the arcane command-line interface and instead would emulate the simplicity of a user's desktop, where papers overlapped each other and were moved at will while actions were performed on them without complex commands to type. In only three years, there machine was created. Another interesting feature about the display is that it employed different squares that could be moved and overlapped with each other, again just like paper, and performed different tasks. These squares were known as "windows" and were controlled using a cursor that would move by changing its position every time the screen redrew. Engelbart's mouse, now ten years old, was used to control the cursor ont he screen. The tasks were performed using a contextual menu that would pop-up allowing you to perform different actions with a click of the mouse. The Alto included many other accessories that was way ahead of its time. It was networked using "Ethernet" technology, a standard created at PARC, and used a "laser printer" which was developed there as well. Now as you can see these were all incredible breakthroughs, so Xerox should've become the leading power in the computer industry, righ? Well, all this technology came at a price. The bitmapped display used a lot of memory, every feature that was added upped the already high price of the machine. In total, the Alto would have a $40,000 price tag. "Unmarketable" Xerox thought, the machine was just way too expensive to only be used by one person. It wasn't until 8 years later, when they created the $16,000 Xerox Star in 1981, that they tried to market the product. By then a world dominated by cheap Apple IIs and IBM PCs was not about to invest thousands of dollars on a computer. Xerox did eventually make computers that sold a little, but it was too little too late. By that time niches had already been set and there was no room for the company. I always wonder what would've happened if they had released it when they did, seeing as how much more primitive computers released much later became such a success. Later that decade several "hackers" began meeting to discuss microcomputing at the Homebrew Computer Club, just minutes away from PARC. Larry Tesler of PARC attended some of these meetings and was appalled by their amazement of small graphics routines on the screen. How could they be so awed by such primitive computing? To everybody but PARC engineers what the club was showing was the future. Another person attending these meetings was Steve Wozniak. Not being able to afford the Altair 8080 systems on display, he began work on his own computer to show off, the Apple-1. 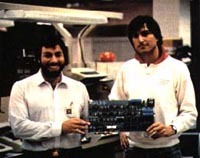 After building the machine, founding Apple Computer with Steve Jobs, selling it with moderate success, and working with future Apple employees, he began work on the Apple II. Needless to say it became an instant success with its color display, Disk ][ drive, and other neat features. In 1979, Raskin, the 31st person to join Apple, began work on a small project that would encompass a $500 business machine code-named Macintosh. He was still intrigued by the Smalltalk, and tried convincing Jobs to take a tour of PARC, much to the disinterest of Jobs. It wasn't until Bill Atkinson, a resident Apple genius working on the graphics routines for another project called Lisa, also suggested he should go that Jobs began to become curious about what lay at the Xerox facility. After offering Xerox a chance to invest $1 million in Apple, which was enjoying exponential stock growth, Apple was allowed two visits to PARC to see Smalltalk and the Alto. His first visit was in November 1979 where he saw the future of personal computing in the Alto. He began to scream and shout how revolutionary it was, and brought a handful of Apple VP's and engineers a month later to check it out. Jobs later demanded that the Lisa incorporate the PARC technology. Bill Atkinson, working for the Lisa group, suped up LisaGraf, responsible for the machine's graphics routines. The Lisa project team members worked furiously for years. They decided to make a application bundle to be included with the computer, and to make it incompatible with the Mac. This would prove deadly for the Lisa project. The $9998 Lisa Office System was finally introduced on January 1983, ten years after the Xerox Alto was developed. Ten thousand dollars for a machine that was notoriously slow, had no third-party software, a black & white display, and was not compatible with any other computer was not a good investment people thought. Very few embraced the Lisa, and like the Alto it was inevitably doomed to failure. Although much of the interface of both the Lisa and Mac was based heavily on the work done at PARC, and 15 of the engineers at Xerox later left to join Apple, much of the Mac and Lisa operating systems were already written before Job's visit to PARC. The Lisa team had added extra features not included in the Alto including the dragging, double-clicking of icons, pull-down menus, a menubar at the top, and the famous trash can. The Lisa OS also had preemptive multitasking. This and the fact that the Lisa team had no guide or set of instructions to follow, therefore having to "reinvent the wheel" according to what some of them had seen is reason enough to give them the full credit they deserve. See a Lisa OS 7/7 screen shot, or a color picture of the Lisa. The Macintosh arrives to a skeptical audience. The Macintosh team decided to take a different approach. Following Raskin's lead and heavily motivated by Jobs, they kept the Mac small, cheap, and cost-effective. Jobs and the Mac team were persistent on "putting a dent on the universe" as the famous quote goes. They allowed third-party companies to develop applications for the Mac. They created the Mac Toolbox, to be set in the ROM. They gave several examples of how to create applications for the Mac and created the Macintosh Interface Guidelines, appropriately nicknamed the religion of the Mac programmer. They created the Finder, arguably one of the greatest applications ever for the machine. It seemed the Mac would be the next big thing, but it too had problems on its introduction. The Mac was too small, too inefficient. Its 128k of memory could barely support the memory it needed to perform the same routines the Lisa did with 10 times the memory. MacDraw (created by Atkinson) and MacWrite (created by Randy Wingginton), two of the applications bundled with the Mac. They were essentially too good. Mediocre software was pratically forbidden for the Mac OS, and there were only so many excellent programmers willing to take the challenge. Even worse, the Mac was being perceived as a toy. Luckily, enough did to save the platform. After the introduction of the Mac 512k, Mac 512ke, and the Mac Plus, as well as applications like Pagemaker, Word, Excel, and much evangelism by the Apple staff, companies began to take notice. "Desktop publishing" was born, and the Mac was ensured a place in computer history. Eventually, Mac style GUIs were even created for the Apple II series: MouseWorks for the IIc and GS/OS for the IIGS. See a conception screen shot of Mac OS System 1.0. See a screen shot of the GS/OS. "Hey, Steve, just because you broke into Xerox's house before I did and took the TV doesn't mean I can't go in later and take the stereo"
Windows 2.03 was released on January of the following year. This version included overlapping windows and Mac-like icons. Nevertheless, Windows was not even up to par with Smalltalk, released 15 years earlier. On March 22, 1988, Apple filed an 11-page lawsuit against Microsoft and Hewlett-Packard, whose NewWave software ran on Windows. The court battle raged on for 5 years during which Windows 3.1 (the most used OS in the world with 40% market share) was released. Thought Apple looked to be winning through most of the proceedings, the suit was finally dismissed. The agreement made by Sculley in '83 along with the fact that the Macintosh was a lot like the Alto was enough for the court to rule in Microsoft's favor. On the bright side, this might have worked out for the best for Apple. In 1991 Xerox filed suit against Apple for the same reason, and the court dismissed the law suit for similar grounds. Rumor now has it that the "undisclosed sum for an Apple technology license" Microsoft paid Apple in August of 1997 to settle any arguments about who plagiarized whose OS was much larger. Today there are several popular graphical operating systems, and people still argue over which is best. Ironically though, out of the near 400 million computer users most still use Windows 3.1, now 6 years old. I won't mention anything about Windows 95, since I wouldn't be able to stop. Windows 98 finally came out, sans the super-hype that came with Windows 95. Personally, I don't see any difference between it and its predecessor with Internet Explorer installed, except for bug fixes and features added years ago in other operating systems. Windows NT 5 has been pushed back...to 1999, and eventually will be merged with Windows 98 to form Windows NTC. It will supposedly bring together features from both systems. Don't hold your breathe till it comes though. Mac users have now seen the arrival of the next product in Apple's OS strategy, Mac OS 8.5. It includes features first promised in Copland, new interface enhancements, and rock-solid stability. A little later on will come the release of Mac OS X Server 1.0, the first consumer version of the OS first announced when Gil Amelio was the chief. Mac OS X Server will stay mostly as a server and power user's OS, while development of it will pretty much stop there. Rhapsody's great technologies will then be combined with the Mac OS's strengths to form Mac OS X. Developers seem the most excited about this approach, because they will not have to write new applications as they would have to with Rhapsody. I think Apple is finally on the rght track, finally regaining profit, making good decisions, and great products. The future looks brighter every day. ©1997-98 Andy F. Mesa. Reproduction of this information should be done for educational purposes with proper credit given where needed. Apple, the Apple logo, Macintosh, Mac OS, and the Mac OS logo are registered trademarks of Apple Computer, Inc.
Microsoft, Windows, the Windows logo, and MS-DOS are registered trademarks of Microsoft Corporation.